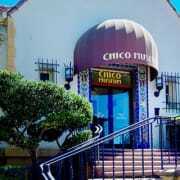 The Chico History Museum, also known as Chico Museum, is the non-profit organization whose mission is to conserve and exhibit the rich history of beautiful Chico, California and to communicate that knowledge for the education and enjoyment of the community and future generations. Chico Museum is located in the historic Carnegie Library Building in Downtown Chico. Chico Museum is a volunteer-run organization. It's mission is to conserve and exhibit the rich history of beautiful Chico, California and to communicate that knowledge for the education and enjoyment of the community and future generations. These goals are embraced by our our dedicated group of volunteers. Each year, innumerable hours are dedicated to greeting museum visitors, leading tours, creating and staging exhibits, hosting receptions, helping in building maintenance and repairs, and other countless tasks. We are very grateful for the accomplishments our volunteers achieve. Serving as a volunteer at Chico Museum provides you the opportunity to be part of sharing Chico’s history with the local community and visitors to the Chico area. We hope that you consider becoming one of our committed volunteers. Would you recommend CHICO HISTORY MUSEUM INC?